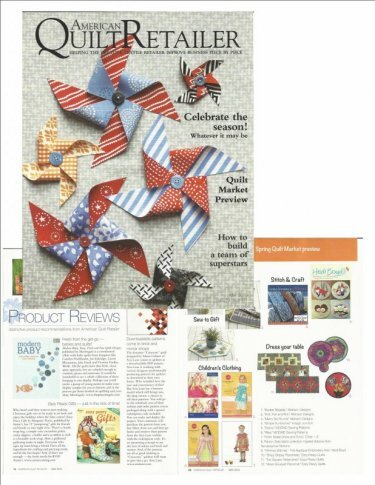 The May 2013 issue of American Quilt Retailer magazine contains a review of the latest book by Margaret Travis, “Eazy Peazy Gifts – Stitched Gifts That Pamper” calling it “just in the nick of time!” for personalized Christmas gifts. The review points out making those little gifts for friends and family ahead of time is a wonderful way to take the pressure from the hectic holiday season. “Eazy Peazy Gifts” contains instructions and patterns for 12 easy-to-make “pampering” items. The most attractive feature of Travis’ creations though may be each of these unique, feminine and fun items can be completed in two hours or less. “Eazy Peazy Gifts” published by Annie’s Publishing retails for $9.95 and is available in quilt shops around the country or online at www.anniescatalog.com. Eazy Peazy Quilts, who will be exhibiting at Spring Quilt Market in Portland, Ore., was also part of American Quilt Retailers “Spring Market preview.” Three Travis patterns, Stripy Stripey Placemats, Too Square Table Runner and Hexie Bouquet Placmemat were shown under the heading of “Dress Your Table.” Additional information is available from www.EazyPeazyQuilts.com.